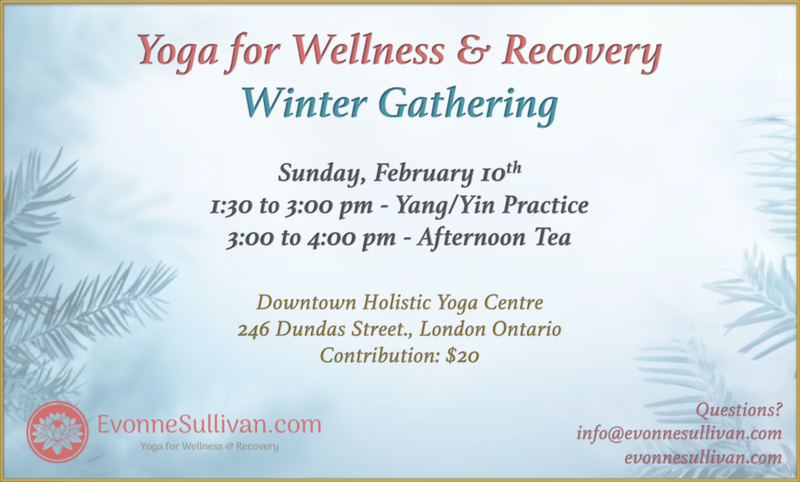 Join us for a Yoga for Wellness & Recovery: Winter Gathering on Sunday, February 10th! All welcome - from beginners to regular practitioners. Details: 1:30 to 3:00 pm - Yang/Yin Practice: combining breathing, movement, postures, mindfulness, music and a final meditation focusing on mind-body health and mood-balancing through the properties of yang (uplifting energy) and yin (calming energy). 3:00 to 4:00 pm - Afternoon Tea : will be provided with light snacks. Please note: Downtown Holistic Yoga Centre is at 246 Dundas Street. Above the bridal store. Door handle must be turned downwards to open. Free street parking on Sundays. Yoga for Wellness & Recovery: Focusing on the relationship between mood management and the mind-body connection, sessions offer a combination of breathing, movement, postures, mindfulness and music. Participants will explore the physical, mental, emotional and spiritual benefits of a yoga practice. Classes are for all levels; offering options for beginners to regular practitioners. Improving the mental, psychological and cognitive well-being in both adults and adolescents, yoga is gaining popularity as part of an effective treatment plan for various conditions and disorders, including stress, anxiety, depression, trauma and addiction. All teachings are trauma-informed and based upon mental health sensitivity.